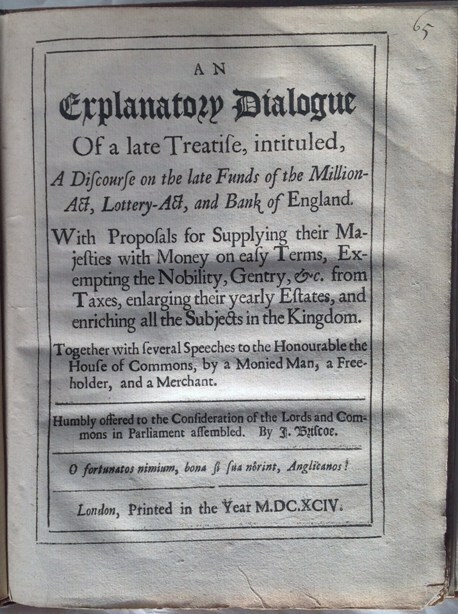 An Explanatory Dialogue of a late Treatise, intituled A Discourse on the late Funds of the Million-Act, Lottery-Act, and Bank of England.With Proposals for Supplying their Majesties with Money on easy Terms, Exempting the Nobility, Gentry, &c. from Taxes, enlarging their yearly Estates, and enriching all the Subjects in the Kingdom. Together with several Speeches to the Honourable the House of Commons, by a Monied Man, a Free-holder, and a Merchant. Quarto, 8.25 x 6.5 inches, 18th century speckled calf, rebacked, spine lettered gilt, leaf edges uncut, pp.viii + 36, title within double ruled border, an excellent copy. Wing B4749. Kress 1834. Goldsmith 3022. Amex 53. Sraffa 555. Not in Einaudi. Not in the Lauderdale Library. Schumpeter, Economic Analysis, pp.314-325. Palgrave I, p.179. see Antoin Murphy, John Law’s ‘Essay on a Land Bank’, 1994, pp.46-49. see Charlie Landale, Land Bank Proposals 1650-1705[in] The Student Economic Review Vol. XXVI. 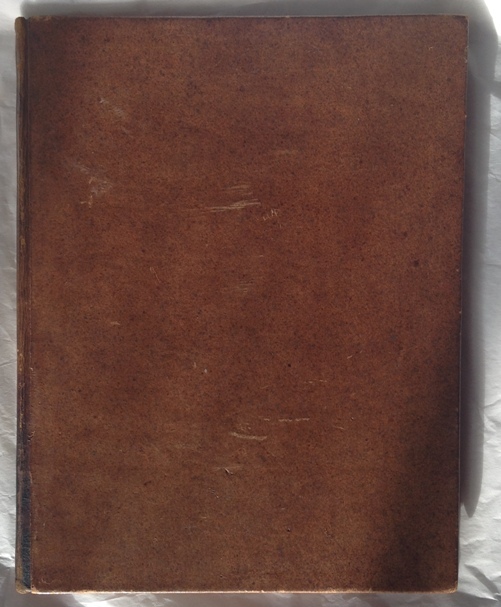 SCARCE FIRST & ONLY EDITION of an important work by one of the leading projectors of land banks, with Hugh Chamberlen and John Law. 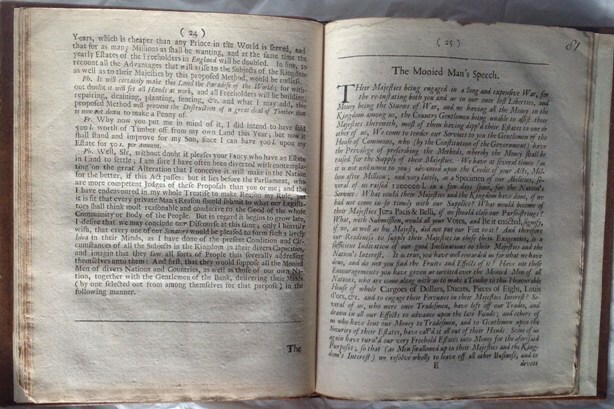 Briscoe’s project was set out in Discourse on the late funds 1694 and this Explanatory Dialogue 1694 here described. Charlie Landale writes “The next most prolific of the land bank projectors was John Briscoe. In many respects, his proposal was similar to Chamberlen’s, and appeared around the same time in 1694. The bank was once again based on the future rental income that could be expected from land. Rather than 100 years income, however, Briscoe only used 20. Unsurprisingly, he was accused by Chamberlen of plagiarism (Horsfield, 1960: 180). Despite the fact that Horsfield describes Briscoe’s major contribution, A Discourse of the Late Funds, as “a lengthy and chaotic work” (1960: 181), it contains some modern theory that puts it ahead of any of Chamberlen’s writings. Briscoe believed that the new investment opportunities offered in the forms of the Million Act, the Lottery Act, and most importantly the Bank of England were drawing money out of trade and into the government’s accounts. In his opinion, his bank would allow trade to flourish and give the government the opportunity to borrow at a lower rate than they were able to from the Bank of England. The rate at which the government was borrowing money, he believed, would lead to the “ruin [of] the trade of the kingdom” (Briscoe, 1694: 3).